How To Earn Money With Revenue Hits In Blogger - Hallo sahabat Information About Blogger, Pada Artikel yang anda baca kali ini dengan judul How To Earn Money With Revenue Hits In Blogger, kami telah mempersiapkan artikel ini dengan baik untuk anda baca dan ambil informasi didalamnya. mudah-mudahan isi postingan Artikel earn money blogging, yang kami tulis ini dapat anda pahami. baiklah, selamat membaca. Revenue hits is a newly introduced ad network and it is best alternative of Google Adsense after Infolinks. It is not better as Adsense but it is not less in any way. If you have only 100 views per day you can earn good with Revenue Hits. It has all types of banners and mobile ads too. CPM as well as CPC rates are also high. Apart from it you have opportunity to refer people using your link. Revenue hits says that you can earn upto $100 per referral. It have all types of referral banners too. After personally reviewing it I recommend it for publishers. This post is a review of revenue hits and a tutorial about how to use revenue hits to earn money via blogger blogs. All size banners are available. Earn $10 to $100 for referrals. Slide out and shadow ads available. Perfect traffic and click tracking analytics. You can payout with Paypal, Payoneer and Wire. 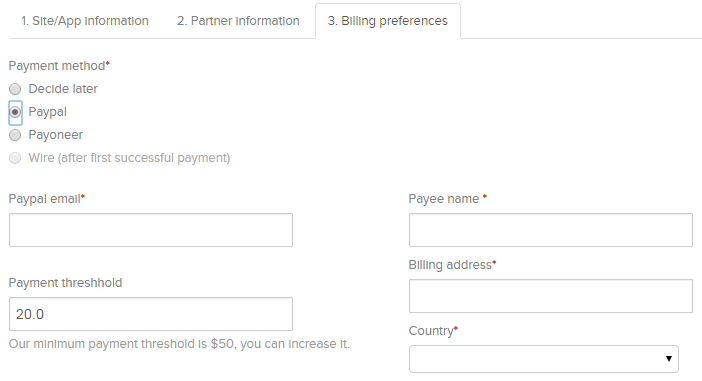 Minimum payout threshold is $20 for Payoneer and Paypal while $100 for wire transfer. Step 1: Go to Revenue Hits. Type your site name, url, description, select type as website and select category of your site. After filling up all the info click on Continue. On the second page type your username, first and last name, your email and password. 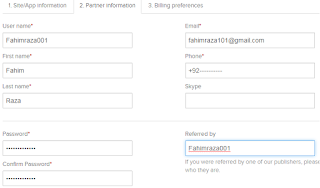 You can also enter your skype name but it is not required. 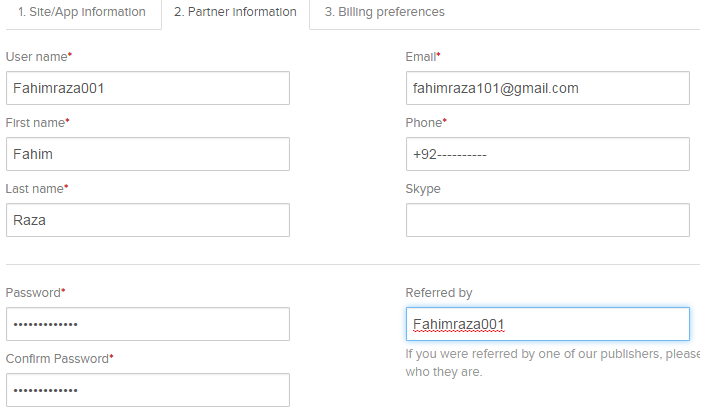 You can also type a referral name, as I told you about revenue hits type fahimraza001. 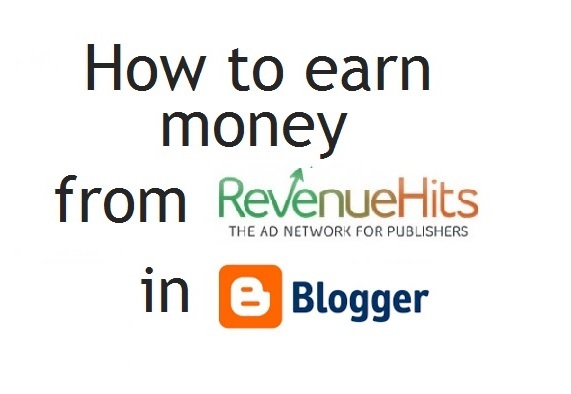 It won't affect your blog's revenue and I will get a bonus from revenue hits. 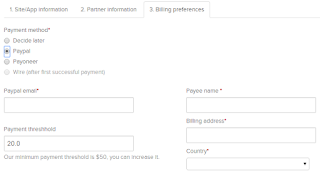 Step 4: Set your Payment type as decide later or if you want to set your paypal account or payoneer account select it and fill out details. 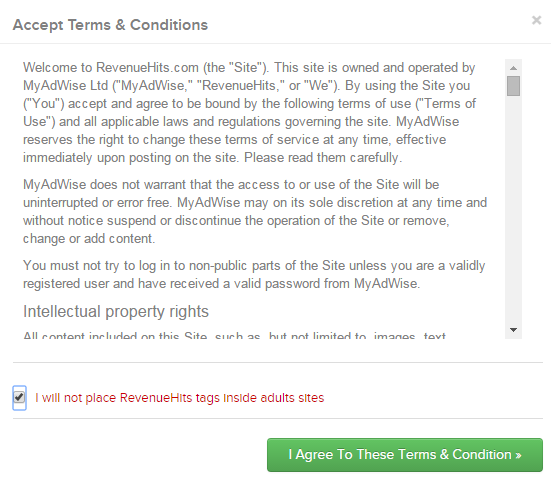 Step 5: Scroll down and click on "I agree to these terms and conditions". Step 6: Finally confirm your account by going to your Email > Inbox > Revenuehits Team. Click on the link in the email you just received and open it to activate your account. 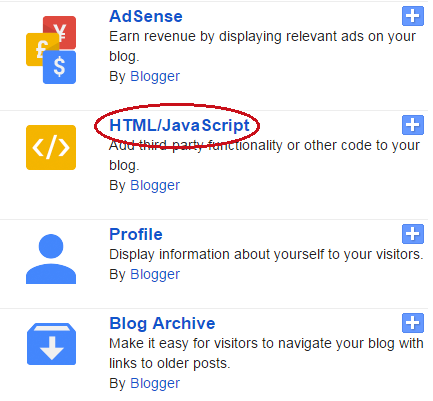 How to add revenue hits ads in blogger? Step 1: Go to Revenue hits and login to your account. 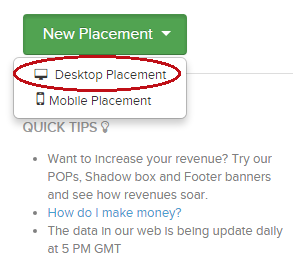 Step 2: Click on "New Placement" on the right side of the page and choose the "Desktop Placement". 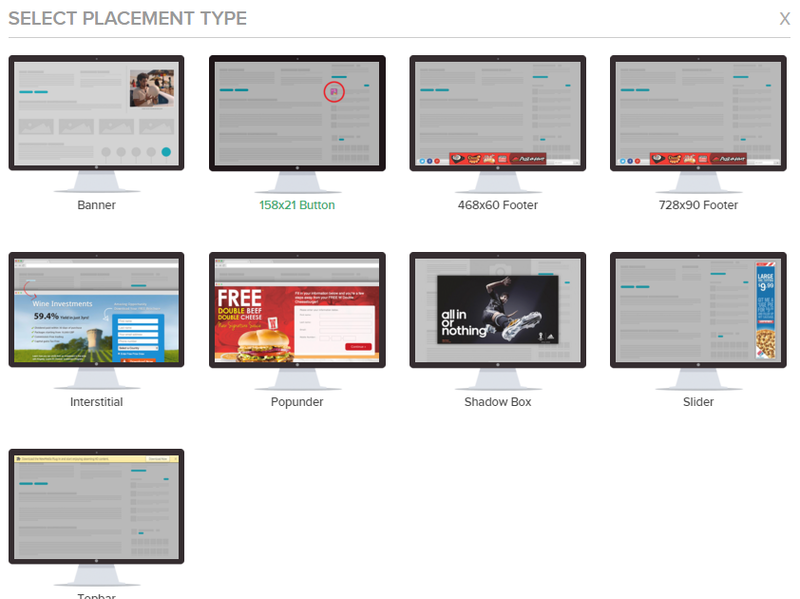 Step 3: Select your placement type from the given options e.g banner, shadow ad, slider, top bar, pop-under etc. 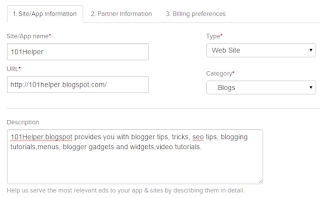 Step 4: Customize your ad and click on save. 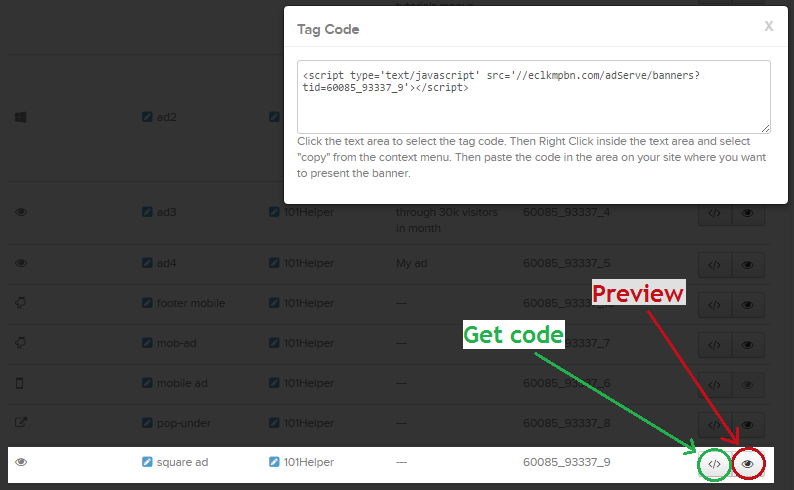 Step 5: Preview your ad by clicking on an eye's icon to see your ad. Just beside it click on </> to get your ad's code. 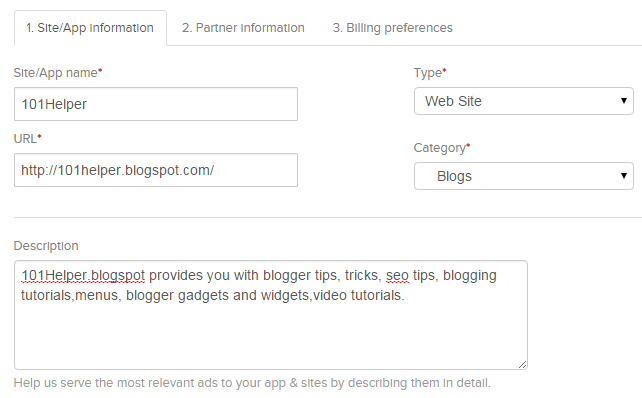 Step 6: Copy the code and go to blogger dashboard. Step 7: Navigate to "Layout" and click on "add a gadget". Step 9: Click on save and you are done. 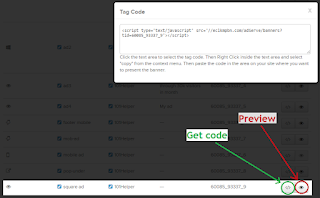 Open your blog to see your ads. You can also create ad campaigns for your mobile site. Just choose mobile placemen in the step 2 and follow other steps as they are. How To Disable Revenuehits POP-UP & Bounce Ads? As you know that pop-up ads affect your site performance and user experience so most of publishers prefer to disable pop-up ads. In revenue hits there are two types of extra ads which boosts your revenue but affect the user experience too. One of these ads are pop-up ads and everybody knows what is a pop-up ad but the second one is bounce ads which is a new thing. Bounce ads are the ads which show up you go back to a page. It also affects users experience to some extent but not as much as pop-up ads. 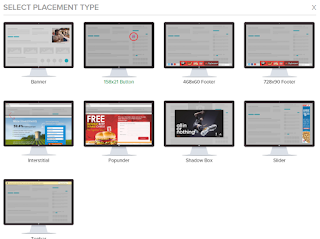 So here I'll show you how to disable pop-up and bounce ads in revenue hits. Note: Disabling pop-up and bounce ads may reduce your revenue but it improves user experience! Step 1: Go to Revenue hits and log-in to your account. Step 2: Navigate to Account > Preference > Extra tag. I hope this post helped you and you have setup your ads successfully. If you found this post helpful please let me know by leaving a comment below and also share it with others. If you have any suggestion you can tell me by contacting me. Thanks for visiting 101Helper. 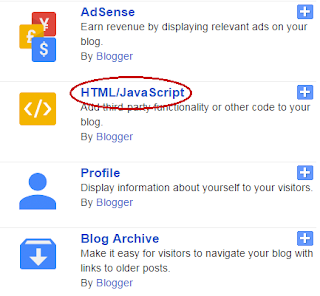 Thank you for visiting the article How To Earn Money With Revenue Hits In Blogger hopefully always provide useful information, see you in another article. 0 Response to "How To Earn Money With Revenue Hits In Blogger"